March 25, 2014 09:46 / 2 Comments on WHY IS THIS? As part of my campaign towards ending the fur trade in South Africa I have started an online pledge for those who will never buy any item containing real fur. This in turn will be used to request that retailers officially pledge to never sell items containing real fur in SA. This has been done in other places. We want South Africa to follow this international trend. If you are interested, clicking on the photo below will take you to the pledge. Non South Africans are pledging in solidarity. “Whether it came from an animal on a fur farm or one who was trapped in the wild, every fur coat, fur trinket, and bit of fur trim caused an animal tremendous suffering and a violent death. PETA’s more than 3 million members and supporters shun fur, as do most stylish celebrities, including Charlize Theron, Penélope Cruz, Eva Mendes, and Kate Winslet. PETA supports the campaign to end the fur trade in South Africa. Please pledge your support today”. Thank you PeTA, for your support. It is reported that of the “16,000 murders which happen in South Africa (SA) each year, many relate to domestic violence” (Carol Freeman – February, 2013) . International Women’s Day was marked this month and Michelle Faul (March, 2014) points out that many South Africans are “soul-searching over the high level of murders and rapes perpetrated against women in SA”. Currently the murder trial of Oscar Pistorius is well on its way in South Africa. For those of you who don’t know, Pistorius is accused of murdering his girlfriend on Valentines Day in 2013. Oscar Pistorius, a South African, was the first double amputee to ever run in the Olympic Games and South Africans refer to him as the “Blade Runner”. He was inspirational to many people with disabilities. For this reason he was used in the Nike sportswear billboard advertisement, as seen below. I’m sure you have noted the unfortunate slogan and of course this advertisement is no longer displayed. Although Pistorius’s trial has made the media, femicide is an everyday occurrence in South Africa. Even PeTA’s anti-fur poster girl, actress Charlize Theron (South African by birth), has experienced domestic violence in her family. In 1991 at their home near Johannesburg, South Africa, the Oscar winner’s mother, Gerda Maritz, killed Charlize’s abusive father in self-defense. Charlize was 15 years old at the time. Her mother was later acquitted because the killing was in self-defense. It is sad, but in a country consumed with social problems, animal rights issues have taken a back seat. There are just not enough of us trying to be the voice for the voiceless. Four Paws is the organisation that has done the most recent research on the shocking conditions of Scandinavian fur farms. This international organisation is campaigning for fashion without real fur. Four Paws is asking seven international companies to stop selling fur. These are: Armani, Burberry, Closed, Kookai, Max Mara, Napapijri and Prada. Please don’t support any of these fashion brand names. Four Paws also runs the “Show Skin not Fur” campaign, as seen below – a fun way to raise awareness. March 12, 2014 09:17 / 12 Comments on WHEN WILL THIS MADNESS END! It is a backpack made from natural/real fur displayed at Milan’s annual fur and leather fair. FUR IS NOT WORTH THE SUFFERING! March 7, 2014 16:29 / 5 Comments on FUR IS NOT WORTH THE SUFFERING! WHAT A TERRIBLE SAGA: Suffering for fur fashion! March 5, 2014 13:18 / 14 Comments on WHAT A TERRIBLE SAGA: Suffering for fur fashion! 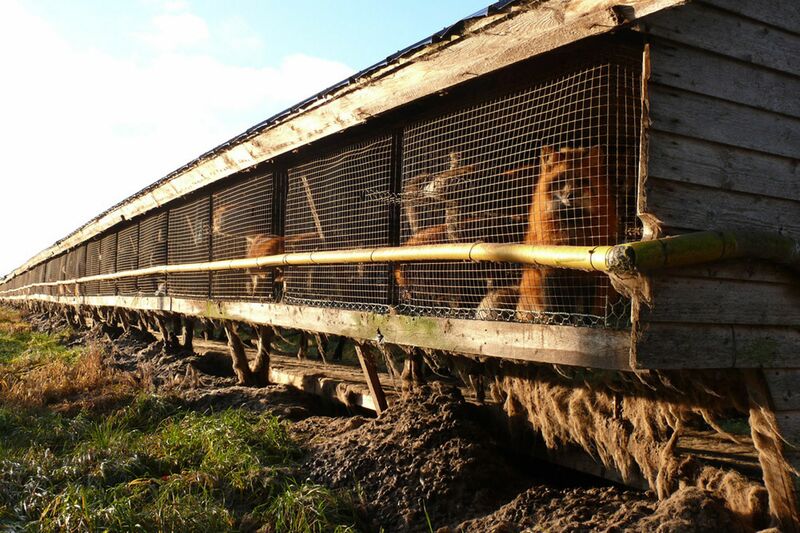 KUDOS TO FOUR PAWS INTERNATIONAL AND THE DAILY MIRROR FOR REVEALING SHOCKING CONDITIONS ON THREE FINNISH FUR FARMS SUPPLYING PELTS TO SAGA FURS (Helsinki). Saga Furs are graded according to the quality of the fur and not according to standards of animal welfare. “THE RESPONSIBLE CHOICE” (Saga Furs) The video, shot in November 2013 and released February 22 2014 by Four Paws, showed animals “listless and cramped in tiny cages with fur, excrement and food-pulp em­bedded in the mesh. The animals don’t have space to move. They have eye infections and some have no tails, which could be a sign of cannibalism. 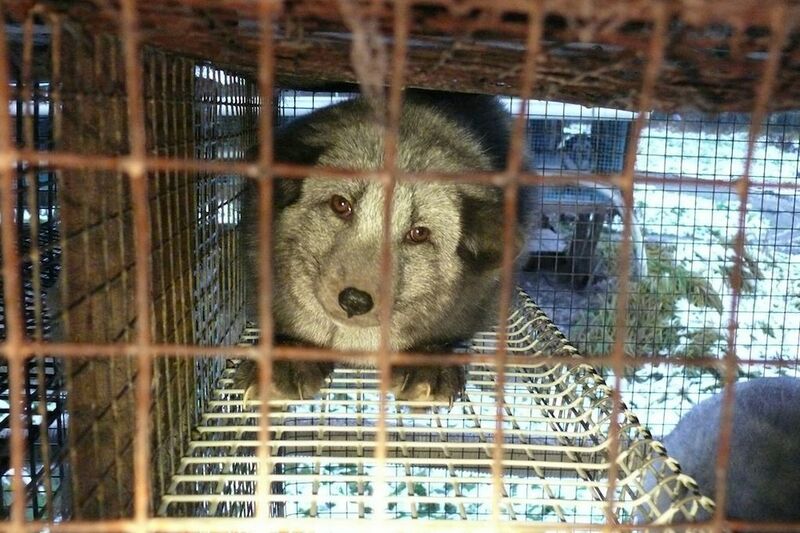 … Foxes are born in a cage, spend seven months there then are killed. This is all they know for their entire lives”. One team member said: “The smell is a mixture of pure excrement, urine and the animals themselves. The howling and barking makes it seem a place of horror and no escape…When you look into the eyes of the animals you get a feeling of the life behind them. It’s heartbreaking”. Alongside Kopenhagen Furs, Saga Furs is one of the biggest auction houses in the fur industry. Saga Furs, American Legend and Fur Harvesters Auction have joined forces for 2014 selling season, where inspections started on March 4 2014. This is NOW! Pelts are brought to Finland to be auctioned. According to Saga this auction “will offer the most diverse selection of quality furs the world has ever seen”. A TOTAL OF 11 MILLION MINK (the innocent creature in photo), 2 MILLION fox and a huge variety of other fur types will be offered during each season (March and June). In a joint initiative involving The International Fur Trade Federation (IFTF), Kopenhagen Fur, American Legend Cooperative, Finnish Fur Sales/SAGA Furs and North American Fur Auctions, the ORIGIN ASSURED (OA™) label was launched. These are all PRO-FUR organisations. This OA™ label supposedly guarantees consumers to know the country of origin of the fur they buy. It is meant to be a country where there are adequate welfare regulations or standards. Of note, the fact that factory farming of animals for fur (which is inherently cruel) is condoned in those countries is not taken into account. As Mr Pietsch points out “A fox in nature will run as much as 12km a day, which gives an idea of how much these animals suffer”. Mink in the wild live on woodland banks and are semi-aquatic. WILD ANIMALS GO INSANE WHEN CRAMPED INTO TINY METAL CAGES. So much cruelty for this!! Saga Furs confirmed a Fendi coat Cara wore in Milan last year was one of theirs. The myth of “ethical” fur has now been debunked in all Scandinavian countries. THERE IS NOTHING ethical. about any fur farm.